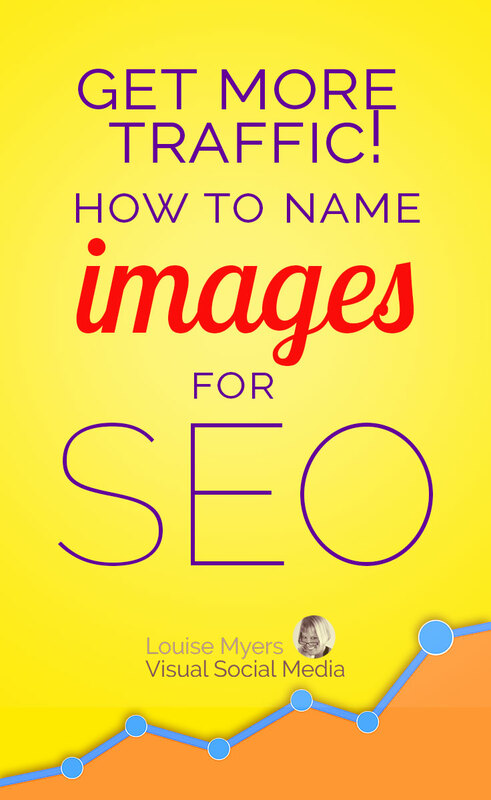 Want to know how to name images for SEO? Naming images for SEO will improve your search engine rankings and website traffic! This tip makes it so easy – it literally will take just seconds, since you’re already using your best keywords in your headline and URL, right? So copy and paste ’em! 1. Optimize your URL for your keyword or words (maximum one or two keyword phrases). My keywords for this post are how to name images and images seo. 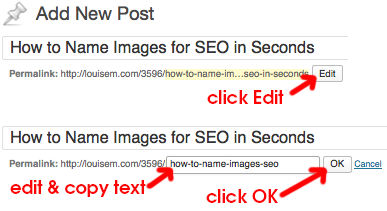 I edited the URL down to how-to-name-images–seo, removing the extra words. 2. Copy your edited URL / keyword phrase, and click OK. Now paste that phrase, including the hyphens, when saving (or renaming) the image you’re using with your blog post. If using more than one image, you can save them with -1, -2, etc. added at the end, or with a word that’s relevant to the particular image. Note: Adding text to the Description field is unnecessary. That’s it! Now you have a keyword-rich image name and alternate text, which you just copied and pasted in seconds. But wait! You have a bit more time? Now copy that meta description and paste it as the Alt Text of your image! It will be picked up as the Pin description when someone saves that image to Pinterest. This is way better for Pinterest than just using the post headline, which is already pulled into your Pin if you’ve got Article Rich Pins. Now the Pinterest Princess can smile on you as well 🙂 And guide Pinterest searchers to your creation. And ultimately, to your blog post! 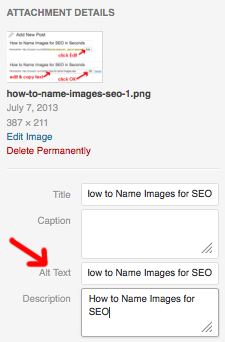 Name images for Pinterest Search by copying your post’s meta description and adding it as the image Alt Text. And here’s where you can find more easy SEO basics to improve your web traffic. This post on naming images for SEO was originally published July 8, 2013 and updated August 31, 2016. Need more help with your SEO efforts? Here’s how to choose the best SEO company to hire. Does a Facebook Page Help Your Website SEO? SEO and Design: Do You Know the Best Practices? Powerful SEO Basics for Beginners to Get Google Love! 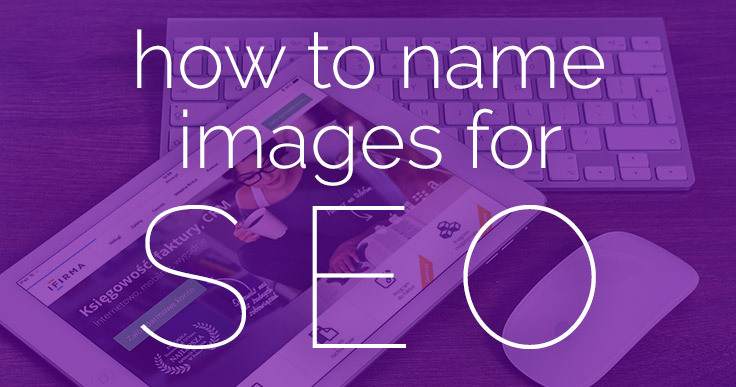 Know others who could use this easy tutorial on how to name images for SEO? Please share! Great tip, Louise! I usually don’t add a description to my photos but with marketing becoming more visual, it’s high time I do. Extraordinary tip, Louise! I as a rule don’t add a depiction to my photographs however its high time I do. We know that content is the king in SEO, but now a days people have no more time to read all these content. So Image SEO really helpful to increase traffic on website and get more benefits. Nice one, Louise, great idea for a blog post! What do you do when you’ve got multiple images on the same post? I’m so lazy this is what I’ve been doing. So, say the image has this filename: “a-yellow-cat-sitting-on-a-hot-tin-wall.jpg”. I insert the image into WordPress and then I cut (Cmd/Ctrl-X) the title and paste it into the alt text. Lazy! And then, sometimes I don’t even bother taking the hyphen out of the alt text. I’ve always wondered if that mattered?! Usually when I have multiple images, it’s a step-by-step tutorial. So I just name them the same with -1, -2 etc at the end. Lazy too – probably better to use similar keywords. Great post and something I haven’t played around with yet. Every little thing we can do improve SEO helps and bit by bit will hopefully push us further up the SERP. I have a question Louise – When you change the permalink of your post, the status of the post should be in ‘Draft’ form. Otherwise if you have already published the post and you change the permalink, your post will show an Error. Is this not right? One thing to note is that you don’t want to publish your post until you’re done / happy with it. If you keep editing and updating, all the “pings” look bad to Google. Always polish it with these details before clicking the Publish button. So would you recommend that we go back and rename all of our photos?! Would that make much difference? Victoria, I wouldn’t go back. I’d just use this technique going forward. I love this post and the step-by-step tutorial. You always make it super easy to implement smart ideas to help with SEO. I know a lot of us overlook naming graphics, but after doing a little bit of research for a recent blog post, I started naming my graphic files correctly AND making sure the alt text and description are filled out accordingly. You’re so welcome, Colleen! I’m glad this helped. You really makle it seem so easy together with your presentation however I to find this topic to be really one thing that I feel I’d never understand. It’s a broad topic, but this one element is easily implemented – and it works! Hi, nice post. I’ve learnt something new – adding the open graph and twitter card tags. Thanks. Now Relay ( relaythat.com) adds seo to images for you automatically. You can have up to 20 keywords added to any set of photos! Can you explain where the keywords will appear with the photo, to help with SEO? I love these types of guides – short, informative and which get straight to the essence! It’s an easy-to-follow guide (images you added also help) so even a rookie can follow the steps! Thanks for sharing! SEO is a passive way to generate traffic. Being active on social media to actively promote your blog seems to be the better approach. Odd comment from someone who works for an SEO company! I’ve removed all your links. Don’t spam comments, that is not a good approach. When naming a photo does capitalization matter? (i.e. Black-Cat-Under-Red-Car.jpg vs. black-cat-under-red-car.jpg) I’ve read articles that show examples of one or the other, but no reference yet to if either is preferred or better SEO. I always use lower case. WordPress will change them to lower case when uploaded anyway. We rarely in the past rename images for seo purposes. Now we found out that seo images are pretty powerful and helps in rankings. I’m glad you’ve found this to be helpful! I’m re-naming my images as we speak! Great article. I can really see how this would help. Do you think there is more importance or weight given to the alt tags or the file name of the image? This is great Louise! Thank you. I’ve been copying and pasting the information in the title, alt text, and description for a few months now, so this is very reassuring! I didn’t know that about including the alt text in Pinterest. That’s great to know! Question: Does it matter whether we use a hyphen or an underscore? I go back and forth between the two. Yes, it does. You should use a hyphen for SEO. Google treats a hyphen as a word separator, but does not treat an underscore that way, so essentially you’re creating a run-on word that Google can’t understand. Very good technique for Image SEO,its very helpful. Great article Louise. I will apply these tips to my photos. Thanks! But how should I alt text many photos (like 30-40 photos) from a wedding. Should they all be the same??? No, I would suggest using varied keywords that are specific to the different images. Your article is very good to know. for ex:if i have 3 image in my article and my main keyword is 1.apple image and my extra releted keywords 2.apple image hd 3.Download apple image. now my questions is if i use all keywords in my article all image alt it will helpful for keywords rank? Well, you could use “download apple image hd.” I definitely wouldn’t keyword stuff though. Thanks for the article, a great read indeed. There is something that is still not clear to me, however, so I wonder if perhaps you could shed some light on it. I’ve searched and searched, but nowhere was it talked about in detail how unique for SEO the image title (in WordPress Media Library), alt text and description need to be. The reason this matters is because I tend to upload a lot of images that are related (say, a single photoshoot with 20 client images to display on a page from that session). Naturally, the title is going to be very similar, especially for, for example, two close-up portraits of a couple. Can I use the same alt text? Do I need a numeric sequence for the title field (Liza and Tom #1, Liza and Tom #2 and so on)? Will Google potentially see it as spam if the titles are the same, without the numeric sequence, and if alt text is the same and so on? I even tried looking at competitors to sort of get the idea, but so few of them actually optimize their images properly, I did not get anything resembling an answer. Thanks for your time, Louise, hope to hear from you! I often use the same image title and alt text, and my results are very good. I don’t recommend this as best practice (I’m not an SEO expert), all I can say is it hasn’t hurt me. Hi! Thank you for an awesome article! A quick question– you mention using the metadata in the alt text field. If you have multiple images in one blog post, do you use the same metadata for each image or do you change it up for each one? I would edit it to be more pertinent to the specific image. Hi! !I am so happy I found this article!My website has been live for about 6 months and traffic has been low. I’ve read hundreds of articles on SEO practices but this by far seems to be the best one I’ve come across. Simple enough for me to understand and apply! So, should I go back through all of my products and make sure the title, image file name and alt tags match? And also are hyphens ok to use in the alt text? The most important thing is to use the right keywords in all those places. I’d start with your most popular or recent products. Match the keywords (or use similar ones – they don’t need to match exactly). I would not use hyphens in alt text. Thanks so much. I will get started on that! Louise – My understanding of alt text is that it serves the purpose of describing what goes on in the image/photo itself. But if I understand correctly what you are advising, you indicate that the alt text should essentially be meta description, which is totally different. I am home decor blogger. For my alt text, I do write a description of what is in the photo, include the title of my post, and add my website name. Then I just copy and paste all of that into the description too. I’ve never used alt text as intended. All I can say in my defense is I get loads of search traffic ? There are so many SEO companies that talk about the importance of image alt tags and they add it in as a service for their clients. If the client actually knew it was only taking a few minutes to do, they might not be as interested in that service! OMG!! I just ran across your article! Super helpful!! The SEO world is such a minefield of unhelpful/confusing advice but this actually makes sense. Thank you, very much!! Thank you for these useful tips. I’d always thought that I should’ve renamed the photos with intended keywords “before” uploading to my image library. So as I understand now, I can upload the images to my library with original names, and “then” rename them once I use them on a specific page. And I can use the same image in the library for multiple times in different pages with different names. Can you please confirm this? No, you cannot rename images after uploading. That would break the link to the image. You can change the TITLE but the image itself would still have the original name.